Work beginning on the front entrance to Nicolet Park. The long-awaited grand opening of the main entrance for Nicolet Park, symbolizing the dawn of “a new day” is set to occur. The event is scheduled for Tuesday, Aug. 21, 2018, at 1 pm. Park amenities include a water spray ground, skate park, playground, recently renovated basketball courts, picnic area, and parking. Summer is a great time for citizens of all ages to check out the skatepark and spray ground – especially since skatepark fees have been eliminated and increased park supervision is being provided. The skatepark is open daily, from 8 am until 8 pm. The facility is unsupervised, except during beginner hours, which are held Thursdays and Saturdays, from 4 to 8 pm. Winter hours will be posted in September. 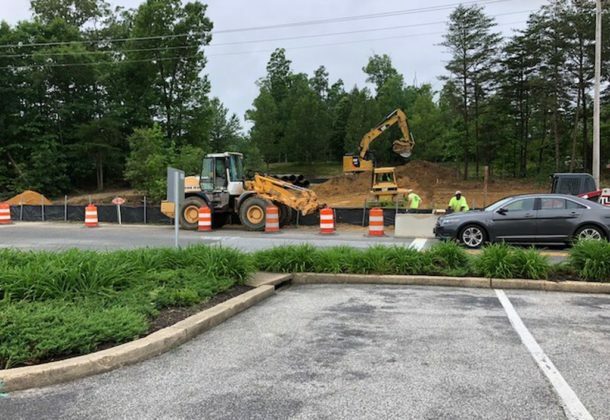 The new entrance is located on FDR Boulevard in Lexington Park, MD, across from the AMC Loews movie theater and Barefoot Graphics and near the St. Mary’s Gymnastics Center. The park address is 21871 FDR Blvd., Lexington Park, Maryland. Questions or comments regarding this project or ceremony should be directed to the St. Mary’s County Department of Recreation and Parks at 301-475-4200, ext. *1811.